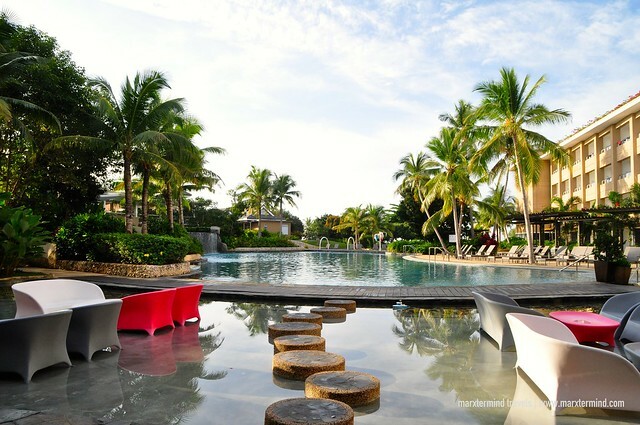 There’s no better place for us to spend our weekend in Bohol than staying at BE Grand Resort. I was luring to stay at this luxurious accommodation since it opened few years ago but it was only last month that I was able to experience it. But that was totally okay. The timing was actually perfect. When I booked a flight to Bohol, I was aiming to have a relaxing getaway. 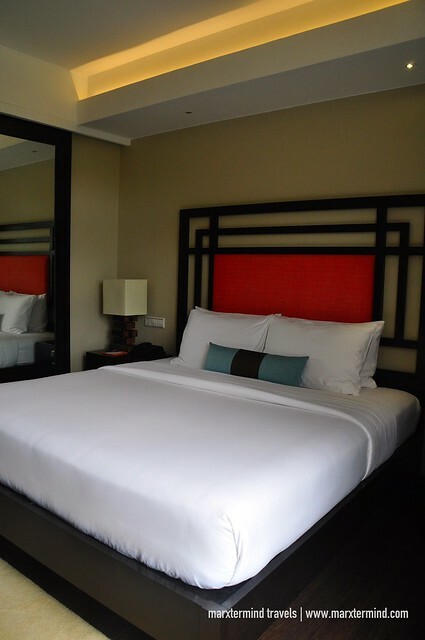 With beautifully appointed rooms and magnificent facilities, BE Grand Resort is a perfect choice for that. 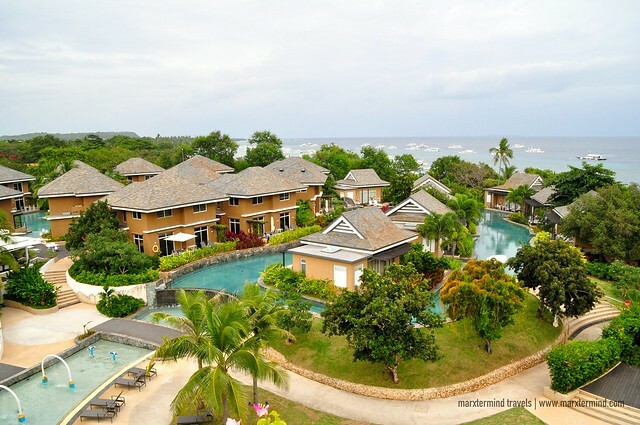 BE Grand Resort is a relaxing and fancy accommodation in Panglao Island. 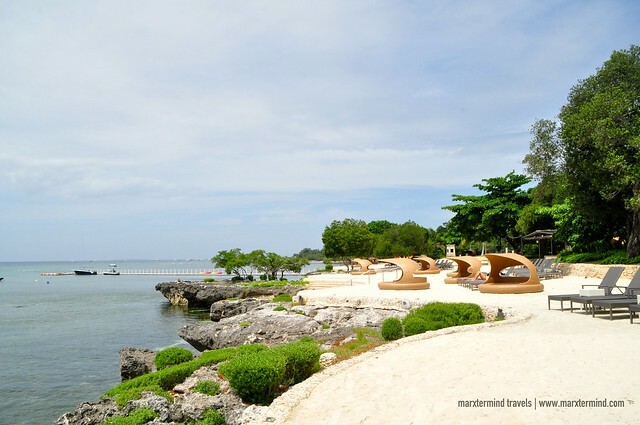 It’s a sister resort of BE Mactan in Cebu. This resort in Bohol is a grand place to have a wonderful vacation because of its well-appointed accommodations and myriad of facilities. It provides guests luxury, comfort and convenience. Going to BE Grand Resort is easy by availing a transfer service. It’s about an hour drive from the airport. Taking an early flight from Manila, it was around 9:00 AM when we arrived at the resort. Entering the premises made us felt impressed of the place instantly. The resort has a contemporary design combined with a laid-back atmosphere. We felt stunned with the interiors of the lobby that later we learned that are creations of Kenneth Cobonpue, a world-renowned Filipino industrial designer. BE Grand Resort offers accommodations in two, The Resort and The Villas. The Resort has four accommodation types such as Deluxe Room, Deluxe Aqua, Deluxe Oceana and Oceana Suite while The Villas has two accommodation types such as Dream Villa and Deluxe Aqua. You may check here for room rate and availability. We stayed in one of the Deluxe Rooms at The Resort. The room was spacious and airy. It has a bright stylish design. 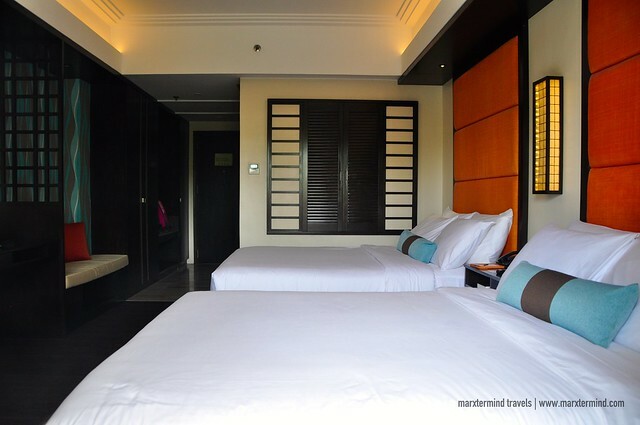 The Deluxe Room has a private bathroom and air-conditioning. It comes with two double beds. The room is tastefully furnished and well-fitted with flat screen television, mini-bar chiller, alarm clock, telephones, in-room safe, and coffee and tea-making facility. There are also cabinets and a work desk. Our room also has a private lanai facing the pool. I like that the resort is also taking green initiative by providing guests water bottles to use. Guests can also take this home for free as a souvenir. What I also loved about our room was the spacious bathroom. It has a separate rain shower enclosure and bathtub. Surprisingly, it has a window that can be opened if you would want to watch a TV while having a relaxing bath. 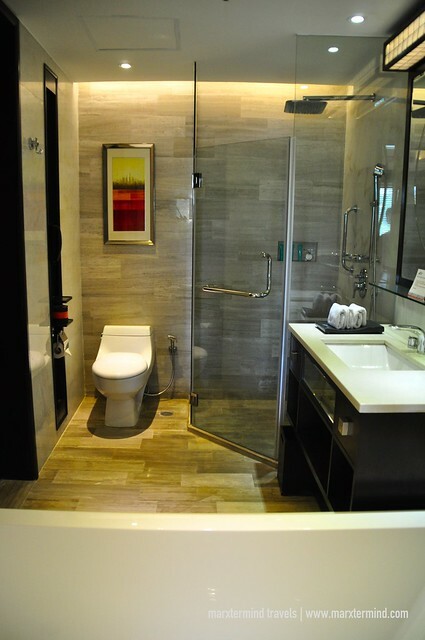 Bathroom amenities are also provided such as toiletries, hair-dryer, bathrobe, and slippers. I like our room at BE Grand Resort. 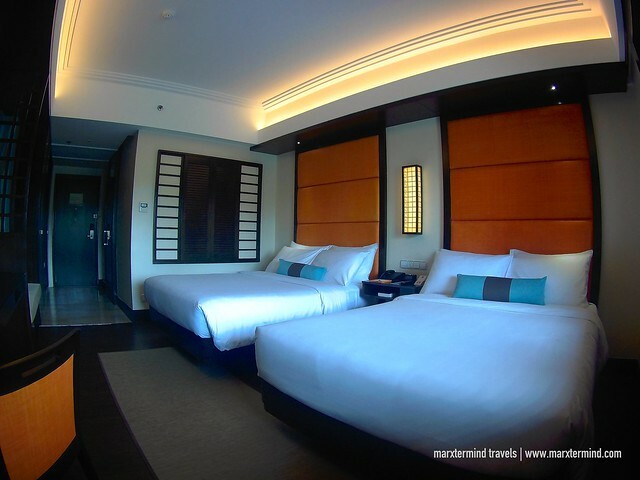 It has the comfort and amenities for us to enjoy our stay. Not to mention, the soothing beds. The bed was too cozy that myself wouldn’t want to leave my bed anymore. We were also lucky that during our stay, we were able to see the other type of accommodations that BE Grand Resort has. 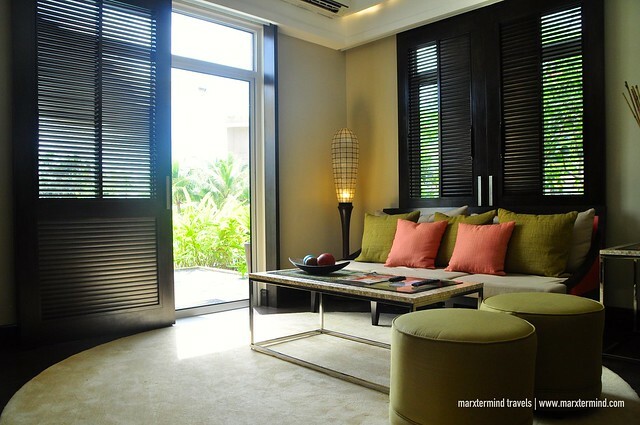 We got the chance to see The Villas, which has residential style villas offering a more exclusive experience. The place is secluded and tranquil surrounded by meandering lagoon pool. My favorite room at The Villas is the Deluxe Aqua. It’s a two-bedroom loft with master bedroom. I like how spacious it is and it’s perfect for families and group. It also has a direct access to a private lanai. 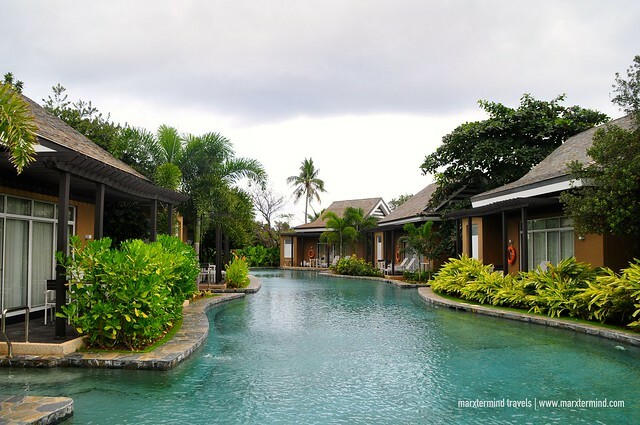 Now, I hope I could experience The Villas when I get a chance to stay at BE Grand Resort again. 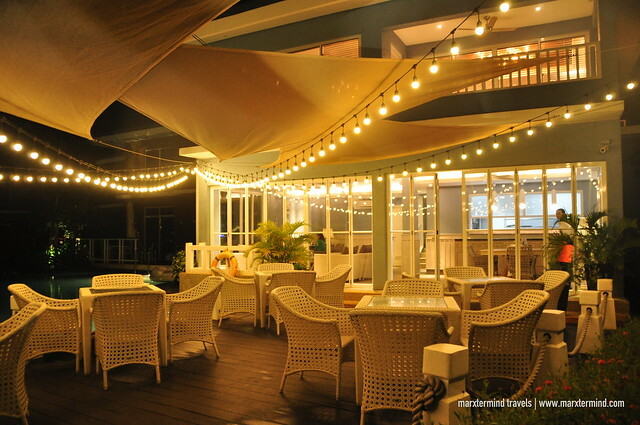 Another thing that made our stay at BE Grand Resort a grand experience was the dining. We were able to sample their breakfast and dinner offerings. The resort has several dining options to choose from. The Food Hall is the main restaurant of the resort. It is open during breakfast, lunch and dinner. 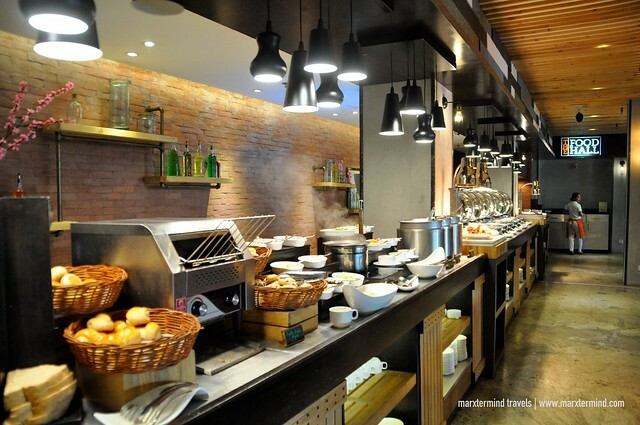 Breakfast here is in buffet style. I like the breakfast choices that has a mix of local, Asian and Western favorites. There were also Filipino breakfast dishes, noodles, salad, pastries, breads, cereals, soup and some beverages. But what I loved the most are the pastries and desserts. Don’t forget to try the Ube Ensaymada. While we had our breakfast at The Food Hall, we spent our dinners at the Bridge Bar and The Boathouse. 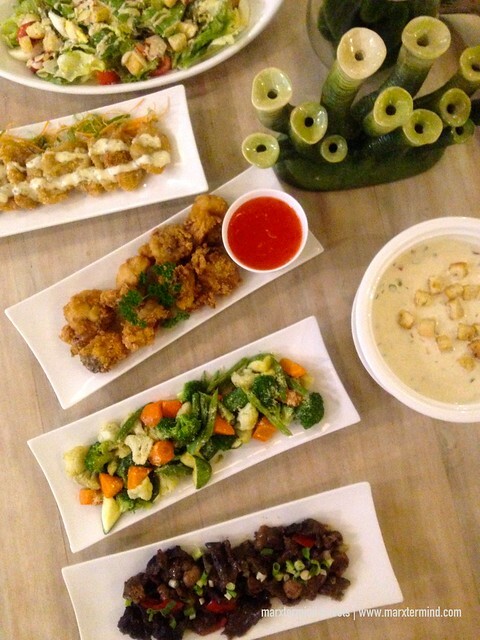 These restaurants offer a mouth-watering menu, delicious dishes and beverages. It was on our fist nigh when we had our dinner at the Bridge Bar. The bar offers an irresistible array of sandwiches, salads, soups, pizza and pasta as well as international selection of beer, liqueur, wine, spirits and signature cocktails. 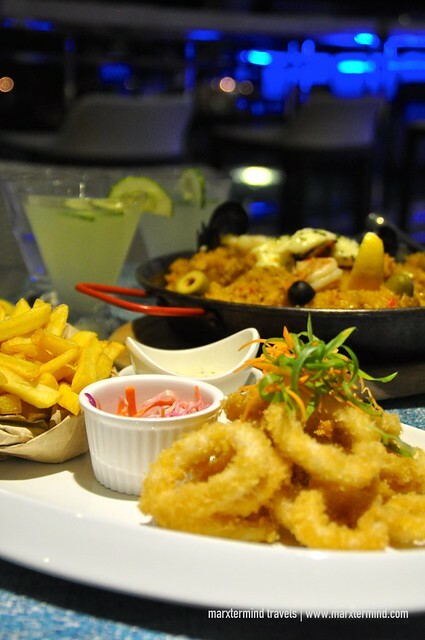 That night, we had Creamy Chowder Soup and a sumptuous Seafood Paella and Calamari with fries, which we all we shared. 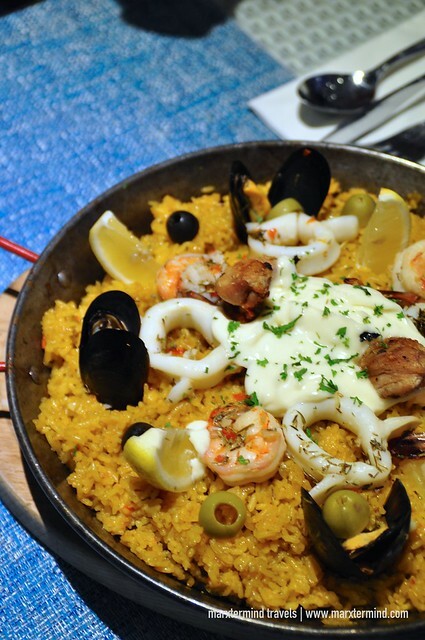 The Seafood Paella is a must try, I must say. We had our dinner at The Boathouse on our second night. The restaurant is two-story and follows a ‘farm-to-table’ philosophy utilizing fresh and locally abundant ingredients that are marketed daily. We had a feast that night. It was a grand dinner. Sumptuous and delicious meals were served on our table. We had Smoked Salmon with Mango and Crab Sticks, Caesar Salad, Buttered Seasonal Vegetables, Deep Fried Fish Fillet, Asian Stir Fried Beef and Home-style Fried Chicken. Our lavish dinner was ended in a sweet note by having Classic Baked Cheesecake, which is one of my favorite cakes in the resort. The Boathouse is exclusive for guests staying at The Villas but non-Villa residents can also dine in here with one-day advance reservation needed. We had a wonderful vacation at BE Grand Resort because also of its number of facilities. The resort has a huge outdoor pool. There’s also a dive pool for guests who want to experience introduction diving. The resort has a diving and water sports center offering various water activities. A spa, fitness center, game room and kids camp are also some of the resort’s facilities that guests can enjoy. The resort also provides complimentary Wi-Fi connection. The resort doesn’t have a beachfront but it has a seafront good for kayaking and snorkeling. 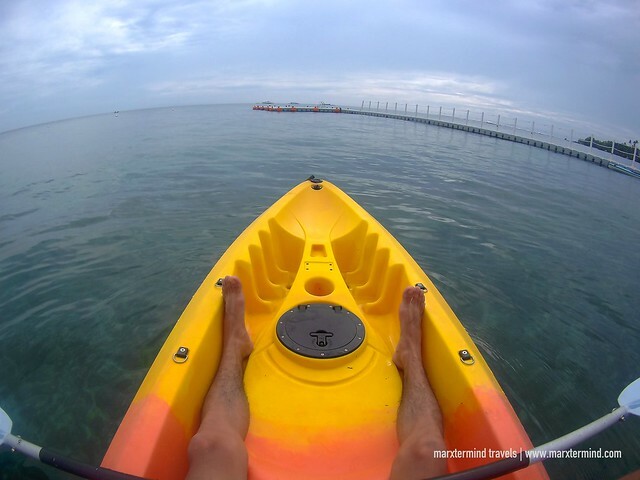 It also doesn’t offer motorized activities to protect the marine sanctuary right in front of the resort but guests can use a kayak for free daily for a maximum of 30 minutes. Circular sun loungers are also available nearby the sea for guests to use. Spending our weekend at BE Grand Resort was truly a pleasant experience. We enjoyed every single thing about this place from our room to delectable food to great amenities. We experienced the best hospitality that made our stay even more satisfying. 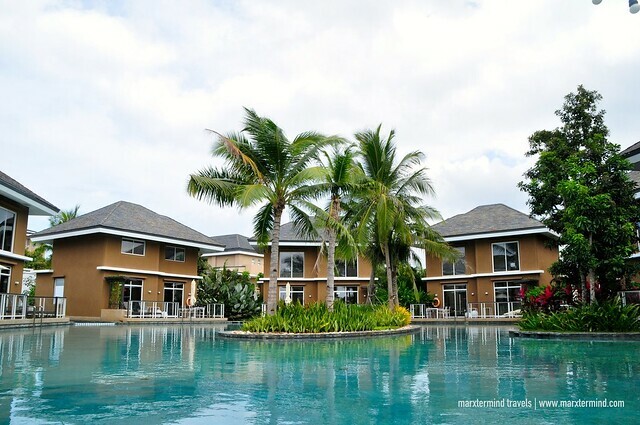 BE Grand Resort provided us the luxury, convenience and comfort to have that wonderful vacation in Bohol.